Hurry, Hurry Drive the Firetruck! Pre-Nursery have had a fantastic time during our topic ‘Helping Hands’. We started off thinking about who helps us at home and at school and thought about how we could be a helpful friend. We then moved on to think about the emergency services, finding out about the jobs of fire fighters, paramedics and police officers. Starfish and Seahorses Class worked together on a giant art project where we created a huge fire engine and an ambulance too. 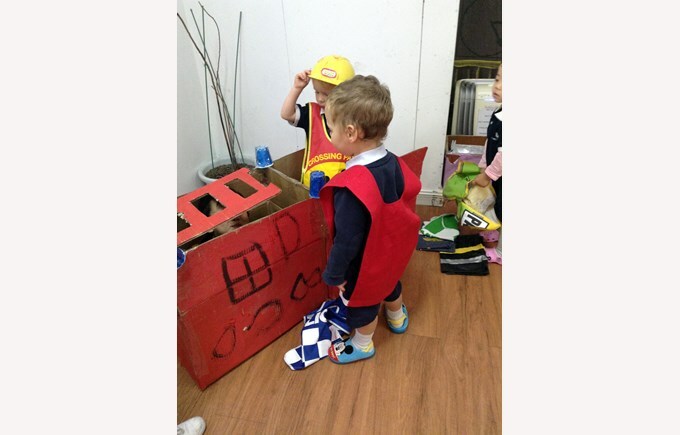 There was a lot of excitement throughout the week as the children took on a role in their play and acted out rescuing their friends, putting fires out all over the school and taking on the role of doctors and nurses. There are so many benefits for young children to engage in role play such as developing their communication skills, enhancing their social skills as children collaborate with others, it encourages children to express their ideas and feelings in a relaxed environment, develops imagination and creativity and of course it’s also a lot of fun!